Camberwell College of Arts MA Conservation Summer Show is just around the corner, we checked in with our first year MA Conservation students who gave us a fantastic insight into their recent involvement of their exhibition ‘Footnotes’, featuring shoes curated by Alison Moloney of London College of Fashion. 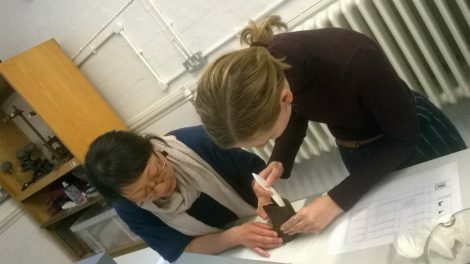 Hosted at the National Trusts Sutton House in Hackney, we asked our MA Conservation students to reveal to us the highlights of the show, from the connection to Queen Alexandra, to the challenge of working with 3D objects that have such a tangible connection to the past. The collection of shoes chosen from the London College of Fashion’s archive reflect the intriguing themes of Scale, Balance, Fragility, Singled out and Common/Uncommon. Highlights include a ‘giant’s’ shoe, shoes made for Queen Alexandra with an unexpected history, and the students’ particular favourite- a shoe for a sheep. The exhibition features artist responses to the shoes, virtual reality and invites visitors to share their own reactions. Displayed within the 500 year history of Sutton House, it feels an appropriate venue with the discovery of a Victorian girl’s shoe found under the floorboards during restoration work in the 1980s. 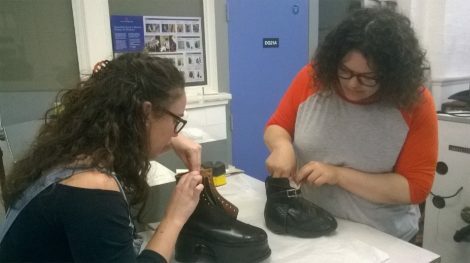 Providing their conservation skills to the protection and display of the historic shoes, the MA students were asked to work to a brief from the curator, the varied styles and shapes of the shoes required creative solutions to provide discrete support. When the objects are exhibited they need to be protected from harmful elements in the environment. This can include dust and pollutants, damage caused by light exposure and mould growth, but also vibration from the feet of the many visitors coming to see them. 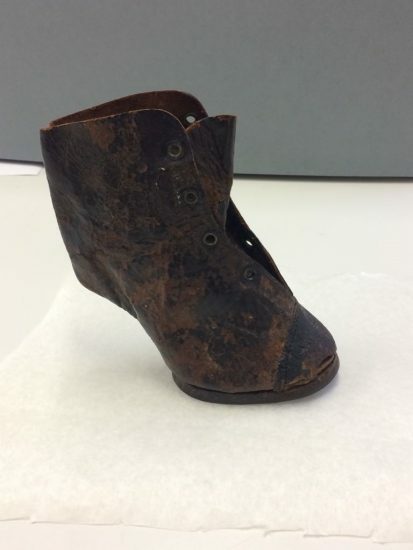 Some of the shoes are quite robust and required little intervention, but others such as the silk boots needed additional support of their fragile materials and to help them stand. Conservation student Lizzie Fuller said: “We are used to conserving books and flat artworks so it was an exciting challenge to be able to work with 3D objects. Everyone enjoyed the opportunity to be able to contribute to an exhibition that provides such a tangible connection to people from the past”. “When checking the condition of the shoes against the condition report, a key practise when first receiving an object to ensure that no damage has occurred during transit or storage, we were excited to find among other things not only a copy of an Archives Collection Description with a very brief condition report but also an accompanying black and white mounted photograph, c 1912 with a letter and ‘history’ from the donor of the shoes. These all contributed to a rather romantic story surrounding the shoes which were attributed by the donor to Queen Alexandra, wife of Edward VII and Empress of India, plus they were made by royal warrant holders R .Thomas & Sons Ltd of London in the early 20th century. 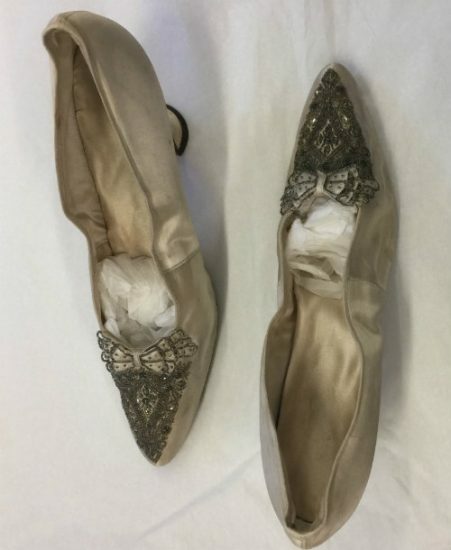 However, the donor speculates that the shoes were never delivered to the Queen, who at the time of making, was in a period of mourning for her husband. 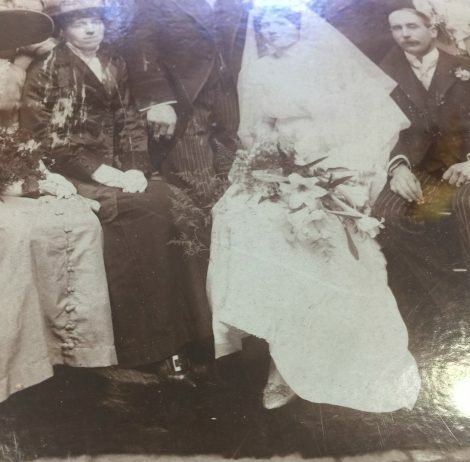 Instead, in around 1912, the shoes became the wedding shoes of the daworn ughter of Frederick McLean, a boot clicker who cut the uppers for shoes at R. Thomas & Sons. The shoes can just be made out, peeping below the petticoats of the bride shown in the black and white photograph included with the shoes. The condition of the shoes was quite remarkable with very minimal overall discolouration to the white satin and very slight tarnishing to the metal thread used for the beadwork on the toe – their elegant finely pointed toe seemed still fit for a Queen. This suggested they had not be worn beyond the wedding and kept in good condition by the donor, Denis Evans, the son of the bride who kindly donated the shoes to Cordwainers at London College of Fashion and their archives in 2013”.